Japanese monaka ice cream has gone upmarket. 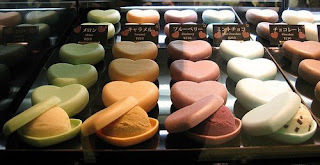 These cute monaka style ice cream really look great with the pretty, crunchy heart shape. Lots of different flavours too. The melon is just like the fruit ice creams you get in the local store shaped in a round melon container. Keep checking back here for more Japanese Ice Cream.